after being honored to provide the amenities for the powder rooms at last year's Oscars®, once again sequoia productions invited kai to be the amenities for the Emmys® Creative Arts Awards. 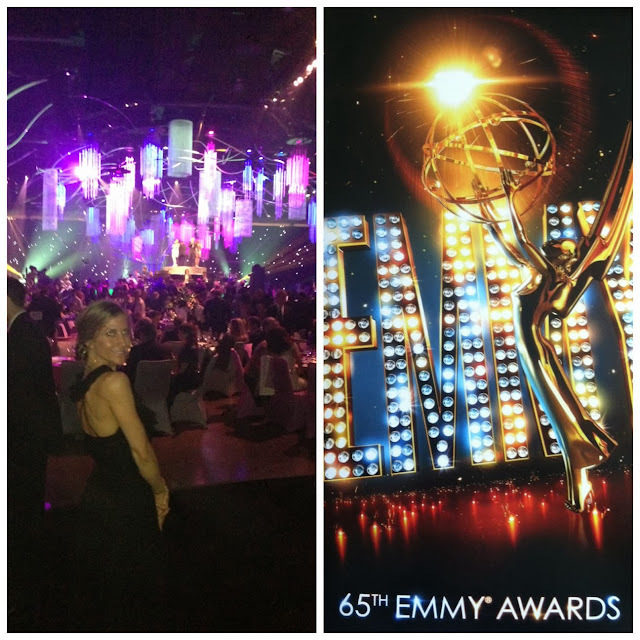 not only were they generous enough to gift us tickets to attend the Governors Ball but invited us to the Emmys®, as well! not being able to attend (read bummed) our vice president of sales, tyler, went in my stead. a look at her photos showed off her absolute style and grace. tyler will take it from here to give you a glimpse of her fabulous evening! p.s. thank you sequoia productions! while usually one to be cozied up on the sofa to watch award shows (particularly the red carpet arrivals) with my best friend, champagne and plenty of snacks, this year i was more than happy to oblige getting glammed up and walking the rep carpet in person! after the show, we were greeted with a glass of chilled champagne (so festive) as we entered the Governors Ball, which was transformed into a dream-come-to-life "enchanted forest". sequoia productions never fails to execute every creative detail of a perfect party -- serene dancers performed behind a delicate silk woodland screen, rocking singers were perched high up on a gilded platform in the center of the ballroom, and tables overflowing with flowers and spirits circled the room... as did the stars! i was so grateful to represent kai and the subtle part we played in a very grand enchanted evening.